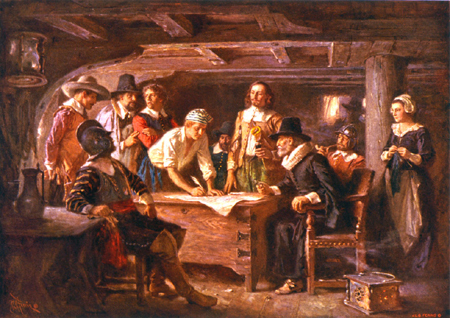 The Pilgrims drafted “The Mayflower Compact” combining themselves into a “civil body politic to enact equal and just laws to serve the common good” in the cabin of the Mayflower before landing – a giant step forward from monarchy to democracy – American-style. Freedom of speech, freedom of conscience, separation of church and state – these are principles that drove the Mayflower Pilgrims. These are principles that lie at the foundation of indigenous cosmology. These are guiding principles of the yet-to-be realized American dream that came through the Pilgrims and the Indians they lived amongst. Was it right for the State to demand uniformity of belief? Or were men entitled to independence of judgment in religious matters? Should all their beliefs be prescribed, or could they read the Bible for themselves and come to their own conclusions about its teachings? “The Pilgrims were not nineteenth century pietists, or quietists. They were not pale plaster saints, hollow and bloodless. They were men – and women, too – of courage and conviction, strong and positive in their attitudes, prepared to sacrifice much for their principles, even their very lives. Far from being Victorians, they were children of another and a greater age, the Elizabethan, and in their lives reflected many of the qualities of that amazing age – its restlessness and impatience with old ways, its passionate enthusiasms, its eager curiosity and daring speculation in all fields, its boldness in action, its abounding and apparently inexhaustible energies. Never did the Pilgrims quietly resign themselves to defeat, no matter what the odds against them. They launched themselves upon the most hazardous of ventures not once but many times, and no obstacle or untoward circumstance could stay them or divert them from their course. Far from being humble and soft-spoken, they were quick in their own defense, fond of controversy, and sharp of tongue, engaging in many a high-pitched quarrel with friends and foes alike, even among themselves. Given to speaking their minds plainly, they expressed themselves in the language of Marlowe and Shakespeare, in the torrential and often rafter-shaking rhetoric of Elizabethan England, with no slightest regard for the proprieties and polite circumlocutions of a later day. In denouncing the “whore at Rome” they meant just that. Pilgrims were Elizabethan, too, in their acceptance of the simpler joys of life. The practiced no macerations of the flesh, no tortures of self-denial. They appreciated the pleasures of the table and of the bottle, liked both “strong waters” and beer, especially the latter, never complaining more loudly of their hardships than when necessity reduced them to drinking water, which they always regarded with suspicion as a prolific source of human ills. They were not monks or nuns in their intimate relations as their usually numerous families and more than occasional irregularities attest. Fond of the comforts of connubial bed and board, they married early and often and late, sometimes within a few weeks of losing a mate. Only on the Sabbath did they go about in funereal blacks and grays. Ordinarily they wore the russet browns and Lincoln green common among the English lower classes from which they sprang. In short, was the “true” church a democratic or an autocratic institution? Co-authors of THE TRUST FREQUENCY: Ten Assumptions For A New Paradigm. Creators of IN SEARCH OF THE FUTURE: What Do The Wise Ones Know? This entry was posted in Uncategorized and tagged Elizabethan age, First50Yrs, Freedom of Conscience, Freedom of Speech, George F. Willison, Mayflower Pilgrims, The First Fifty Years. Bookmark the permalink.